Hen Domen is an earthwork motte and bailey fortress, founded in the 1070s by Roger of Montgomery. 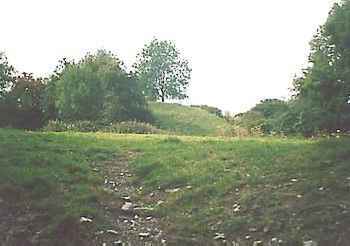 Sited east of the Rhyd Whyman ford over the River Severn, the large mound and eastern bailey are defended by double ramparts and ditches, with counterscarp banks. After Robert rebelled in 1102, the castle became the property of King Henry I and until 1207 it was held by the de Boulers. From 1215 the area was under Welsh control and the castle fell into decay, reoccupied in 1223 when Montgomery Castle was built, by the late 13th century the site had been abandoned. Hen Domen is the most extensively excavated timber castle in Britain and has a complex history of unexpectedly grand and complex building in wood. The motte was crowned by a timber tower, which was connected by a bridge over the motte ditch to a hall within the bailey. Encased by a wooden palisade flanked by wooden towers, many other buildings stood within the bailey, including a granary and a possible chapel. Hen Domen is located west of Hendomen, off the B4385. 23 miles south-west of Shrewsbury, on the B4386-B4385.